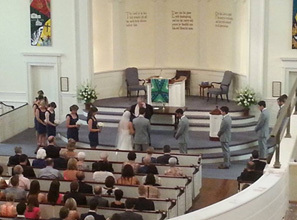 The marriage service is a service of worship and is one of life’s most significant events. In marriage, two people commit themselves to faithfully live together, with God as their Rock and Cornerstone. This commitment must not be entered into casually, or carelessly, or from selfish motives, but responsibly, prayerfully, and with freedom and strength. If you are interested in having your wedding at Nassau Presbyterian Church, first attend worship and introduce yourself to a pastor; Rev. Dr. Dave Davis or Rev. Lauren McFeaters. A Wedding Coordinator will work with you to secure a date. Please note that we do not temporarily hold dates and we require a minimum of six months notice for any wedding. We also require multiple sessions of premarital counseling with a pastor. Please contact Noel Werner (noel.werner@nassauchurch.org), Director of Music, concerning music for your wedding.